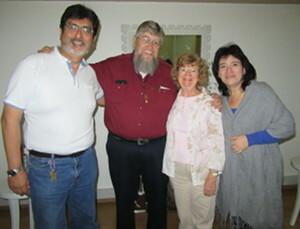 Thank you for praying for our teaching trip in Peru. Your prayers were evident as God used the teaching strategically, and we enjoyed good health and good fellowship with the saints in each of the locations where we ministered. We wanted to share some snapshots, both in words and pictures, to help you, well, picture where we were and what God was doing. Our first venue was in a section of Lima called Eloi. That's where Jorge Watanabe, the son of a Japanese immigrant, serves with commitment, dedication and purposefulness in his church and in his superintendent responsibilities. Their building is a large four-story affair that houses the sanctuary and a small church kitchen on the ground floor, and a small children's area, plus various apartments and offices on the upper floors. 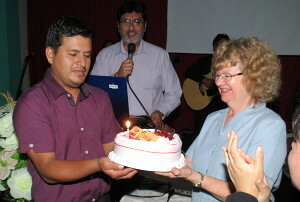 Jorge and his wife, Janine (an obstetrician), pastor this congregation, and Jorge also is the Superintendent of several churches which are spread out across Peru. This is very much a big-city church, and the city of Lima seems to still carry the lingering effects of trauma from the years of terrorist activity in their recent past. The perpetual gray skies seem to be echoed in the psyche of the populace. The Lima church has a desire to provide training and discipling opportunities through home meetings, with the understanding that this is vital for outreach and growth. 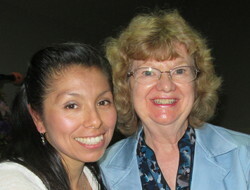 Pastora Amelia Torres, the most faithful student in Lima! 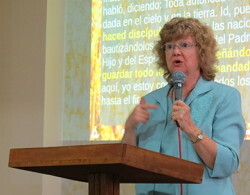 So in addition to teaching the second course of Hermeneutics [don't let that big word throw you – we focus on studying the Bible in context], with the practical exercise of applying the principles to a study of Woman in the Kingdom of God, we also taught on Leadership in the Church, particularly as it applies to small groups. 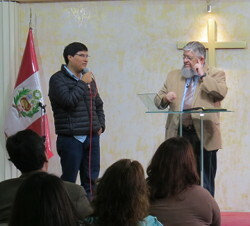 Those who came to the teaching sessions were very receptive and appreciative – particularly one of the pastoras from Ventanilla, a suburb of Lima where we taught last year. We flew from Lima to Huánuco, a city in the Andes in the valley formed by the Huallaga River, at an altitude of almost 6300 feet. This is a much smaller city, much more pedestrian, and with mototaxis filling the narrow, bustling streets. The church here is pastored by Ernesto, the former Marxist rebel (whose full name it seems wiser to omit), and his wife, Mari (another obstetrician!). A Huánuco fiesta for Denise's ? ?th birthday. Ernesto is full of passion and enthusiasm, and is an accomplished musician, playing traditional Andean panpipes, as well as a guitar and probably other instruments as well. Ernesto was radically transformed by the saving power of Jesus. 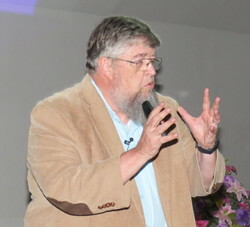 He has an evangelist's heart as well as a pastor's heart, and the people in his church are enthusiastic in the Lord, and hungry to grow in Him. 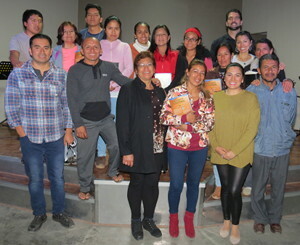 They also have a vision for practical training and discipling through home groups, and so we taught the same Leadership Training course there that we did in Lima (in fact, Pastor Ernesto is the one who originally requested that teaching). And we also taught the second course in Hermeneutics there, since they had been taught the first course last year – and were very enthusiastic about it! These people were eager and keen to hear the teaching, coming for three weeknights in a row, until ten o'clock each night. A quick flight back to Lima, and a long, slow drive through the tangled city traffic took us out to the barren, boulder-and-dirt desert town of Jicamarca, an outlying city from Lima. This place is like a moonscape, and might appear “God-forsaken,” but once you arrive at the Iglesia Vida (Life Church) oasis-like compound, it quickly becomes clear that it's anything but God-forsaken! 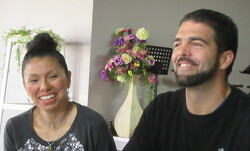 David Hodges, a young American missionary who has spent half of his life in Peru, and his Peruvian wife, Cecilia, pastor the church and ministry here. 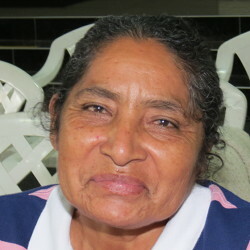 They have transformed their property into a light to the community through diverse outreach ministries which meet many needs of the people in this outlying district, and draw those people into a relationship with the Lord, with each other, and into the church. David and Cecilia are very relational, and every outreach provides an opportunity for them to build relationships. 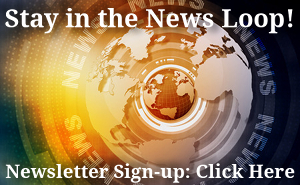 Art classes for children, musical-instrument classes, English-speaking classes, physical fitness training classes, teas for the women, and a soccer field and playground for the kids are some of the ministries taking place throughout each week here. 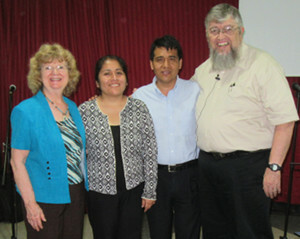 Our connection with them was that Cecilia was our translator in Lima last year, and she was so enthusiastic about the teaching that the last day she brought her husband, David, and a contingent from their church with her. 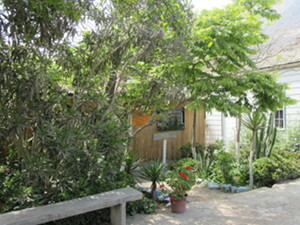 They asked for us to come and teach at Jicamarca, and David had made a specific request for some teaching on grace. Well, we hit the ground running, as Denise was the scheduled speaker at a women's tea which started shortly after we arrived. That time of sharing on forgiveness was very fruitful! Then we moved into the first evening of teaching, kicking off the first course on Hermeneutics. The response was lively, excited, and receptive – and that continued throughout our four nights there. Once Hermeneutics was finished, we launched into the teaching on The Purpose of Grace. 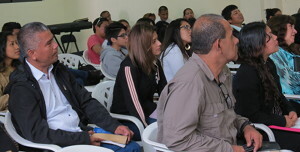 There were several other pastors there for the first night of that teaching, and the digging into the Scriptures was clearly very eye-opening and helpful for them. We have only had time and space here for small snapshots into the teaching, and into the people and ministries where we shared, but hopefully this gives you some insight into God's working in each place. Your prayers and support are bearing lasting fruit for the Kingdom – fruit that continues to multiply, as these pastors and leaders take the teaching and implement it in their churches and in their own ministries. Thank you for partnering with us at Finest of the Wheat Teaching Fellowship!